We connect to your computer remotely and handle issues ranging from virus and malware removal, antivirus and security software issues to home networking, computer tune-ups, troubleshooting email problems and more. We provide you with fast service while saving you money and increasing productivity. Has someone in your office been unable to complete a task because of a minor problem with their computer? Do you have a staff member that spends more time helping others with their computers than they do completing their own work? Remote Support Servicescan eliminate these efficiency killing problems. We perform a full and thorough malware/virus removal on any infected computers to ensure that the system is fully clean and secure. Back up your important data such as pictures, videos, music, and documents through our cloud data backup service. It’s a fast, efficient, secure and reliable. Since Mac OS is different than other operating systems, it requires a different set of expertise. Our techs are well versed in all facets of Mac OS X 10.5 or newer. Computers and mobile devices run software applications (or “apps”). From Microsoft Office to games, our techs are familiar with all of the widely used apps. Your computer requires basic preventative maintenance. Our computer tune-up will ensure that your system is running as fast and efficiently as possible. Are you having trouble getting any of your devices online, such as computers, smartphones or tablets? If so, we can get them working. We have in depth experience with all the major brand of printers, scanners, and multi-function machines. We can help with the setup and troubleshooting of these devices. The home network is becoming a necessity. However, networking devices, such as routers, can quickly become complex. Our support techs can solve any issues that you encounter. Wireless internet is a convenient and useful technology that many devices use. We can assist with connecting, troubleshooting and securing a wireless connection. Windows is the most commonly used operating system for PCs. We support Windows XP, Windows Vista, Windows 7, Windows 8, Windows 8.1 and Windows 10. Do you need a question answered, or to be shown how to do something on your device? Our techs are readily available to provide you will the appropriate guidance. Mobile devices, such as smartphones and tablets, are integral parts of our lives. Yet, they have their own unique systems that sometimes require expert assistance. Get eSanshar Support & Service NOW! The next time you have a question or issue with your computer, laptop, tablet or other device, call us to see if we can assist you with our Remote Support Service. 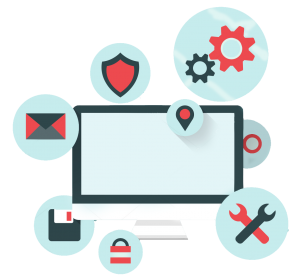 In cases where remote assistance or online remote support is not adequate, a professional from eSanshar IT Experts will visit the site.